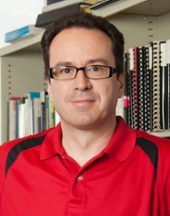 Krešimir Josić, professor of mathematics at the University of Houston’s College of Natural Sciences and Mathematics, is one of 40 U.S. and Canadian faculty awarded a 2015 Simons Fellowship in Mathematics. He is the only recipient from a Texas university. Krešimir JosićFor his fellowship, Josić will spend the 2015-2016 academic year visiting the lab of Matthew Bennett, a synthetic biologist at Rice University. Josić will work on developing mathematical models to guide the design of synthetic microbes. Josić has an ongoing collaboration with Bennett. The two have worked jointly to engineer and model synthetic organisms that can compensate for changes in temperature and display preprogrammed dynamics. The team’s next goal is to engineer microbial populations that interact in controlled ways. Through this sabbatical, Josić will be able to participate closely in the experimental design and data analysis. “A closer involvement with experiments will help me in the development of new mathematical models,” he said. According to the Foundation’s website, the most important criterion for receiving a Simons Fellows award is the potential for research accomplishment, as judged by accomplishments over the last five years.